Ralph Rehbock discusses Kristallnacht on Monday night at the Tannenbaum Chabad House. Rehbock is a survivor of the 1938 pogroms. Holocaust survivor Ralph Rehbock, the vice president of the Illinois Holocaust Museum and Education Center, speaks frequently about the events that occurred after 1940. Monday night at Northwestern, however, he shared a different tale. 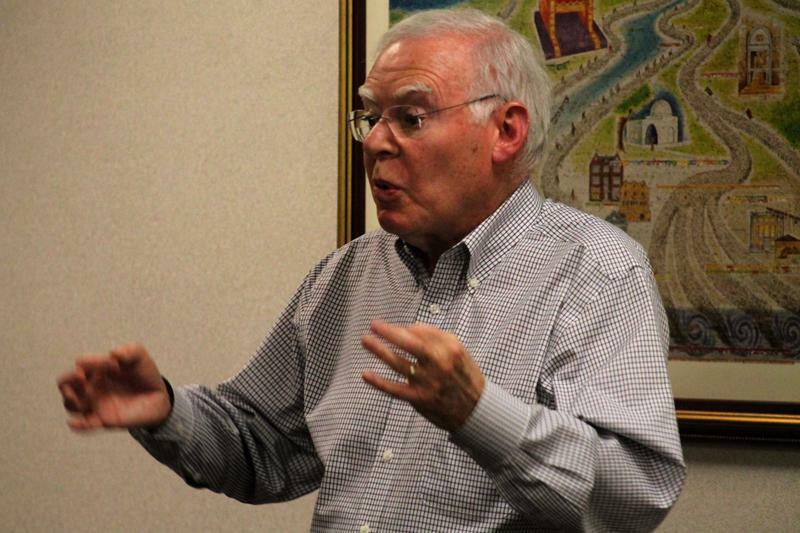 Rehbock spoke to an audience of about 50 at the Tannenbaum Chabad House about his experiences as a survivor of the Holocaust and Kristallnacht. This month marks the 75th anniversary of Kristallnacht, when Nazi forces destroyed thousands of Jewish-owned businesses, buildings and synagogues in Germany and parts of Austria on Nov. 9 and 10 in 1938. Rehbock began his story by detailing the events leading up to Kristallnacht, translated as the “Night of Broken Glass,” and emphasized that unlike most Holocaust survivors, he was not going to only tell what happened in the late 1930s and early 1940s in Nazi Germany. Rehbock began his story nearly two decades earlier, in 1923. World War I had ended five years earlier, and the country was in a state of distress. They had lost the war, inflation had skyrocketed and a depression was looming. That, he said, was when the politicians came along. He recalled close to 30 different political parties, among them the National Socialist German Workers’ Party. The propaganda began slowly. Signs were plastered on every street corner, bearing anti-Semitic slogans. Lies were spread, Jews were beaten and Hitler continued to gain power. The Nuremberg Laws were put into effect, denying Jews basic rights including owning a passport and getting married in a synagogue. After a while, Rehbock said, his parents decided they needed to find a way to America. In 1938, when Rehbock was 4 years old, they made an appointment at the American embassy in Berlin to try to obtain a visa. Their appointment was for Nov. 10. The evening of Nov. 9, Rehbock recalled, he looked out of the hotel room window to see a synagogue down the street burning, and little did he know that the synagogue in his hometown of Gotha, Germany was being incinerated as well. The family had hired a teenage girl to watch the house, and they later learned that Nazi thugs had come to their house that night, demanding to speak to Rehbock’s father. The girl feigned ignorance, which prevented the father from being among the 30,000 men arrested and shipped off to concentration camps that night. Throughout his story, Rehbock stressed that it could well have had a different outcome if not for the kindness and compassion of strangers. Rabbi Dov Hillel Klein, leader of the Chabad House, recognized the importance of having a speaker with personal knowledge of the Holocaust, which he said is “part of our Jewish identity.” As Holocaust survivors become older, he said, being able to interact with them becomes even more important, for not only the Jewish community, but also the world as a whole.